The horrible crisis in northern California goes on and like many crises, it gets a little better every day, and then gets much worse. The destruction is unimaginable. An area the size of the city of New York is/has been engulfed in a blazing hell. We, of course, suffered some of the worst moments of our lives with Katrina, the failures of the levees, the loss of lives, the heartbreak of leaving New Orleans, and the return to wet, ruined and moldy homes. So, in a very real and analogous way, we can relate. Our neighbors in California are not faced with changes of life because of water, they are faced with unspeakable conditions because of fire. I will not venture a guess as to which is worse, fire or water, but the weight on the human psyche is the same, without a doubt. The fires currently raging in Northern California are ferocious. Winds at speeds of 50 – 60 miles per hour and higher have whipped the flames and sent them off into all directions. This very moment brave firefighters are working incredibly hard to just contain the inferno. Next step is extinguishing. What the next step after that is, no one really knows. Whole neighborhoods and complete sections of towns have gone up in smoke. What it took generations to build, the fire destroys in minutes. Watching a wall of fire approach your home from the end of the street you have driven on for years cannot be easy. Evacuation, making decisions on what possessions to grab and what to leave to inevitable vaporization, focuses the mind on what is truly important and meaningful. For the most part, we did not have to make those decisions. For many of us, we were leaving home in the sunshine just for a few days while the hurricane came in and went out. We sort of took the attitude like a shopkeeper: Be Back in 5 Minutes. Did not turn out that way but the episode started that way for most of us. Leaving home to escape a fire that burns like a blowtorch is more permanent. And when you close the front door, I am certain you are wondering whether to lock it. What’s the point? Before Katrina’s evacuation, all of us locked the front door. We were coming right back. In Sonoma alone, more than 6,700 buildings burned, 22 deaths but more reports will be forthcoming (overall 41 people died in northern California’s fires), $3 billion in losses and counting, over 100,000 people displaced but many are now returning to homes, assuming homes are still in place. Then there is the matter of employment. Katrina was not about losing our jobs. The residents of Northern California are losing their livelihood. Grapevines do not tolerate fire. Total destruction and use of the land for an unknown, but surely long period is what they are facing. With the 2017 harvest about 90 percent complete before the fires struck, can the rest of the grapes be harvested? What about that fermenting juice in the tanks? Will it be affected by the smoke and the heat? What will the future effects of the fires be on the vineyards, which became excellent fire breaks, and in many cases actually slowed down fast-moving infernos? 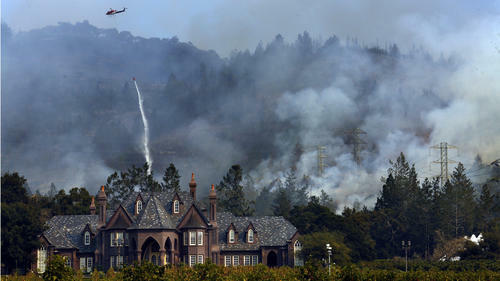 Even those vineyards that sustained no direct impact from the fires, what about the precipitates from the air that fall on the land and will soon leach into the soil with the coming rain season? Over the next several months, this column, every week, will update you on progress in Napa, Sonoma, Lake and Mendocino Counties in northern California. We will pass on to you trustworthy resources should you wish to contribute to the rebuilding of the area and the lives of the inhabitants. We will be applying that same advice to this situation. If we can do more, then all the better. In the meantime, just take one moment right now to bow your head and pray for the great and decent people of Northern California. They have brought us much pleasure and we owe them good thoughts.